There’s nothing like the feeling of being wrapped in a warm hug as you drift off to sleep. That snuggly feeling is just one of the declared benefits of weighted blankets, one of the biggest wellness trends of the year. If the 2018 holiday shopping season was any indication, tons of people are in need of the pressure that a weighted blanket provides. But what is a weighted blanket? And is this sleep product really all that it promises to be? As a massage therapist, I understand the relaxation benefits that come from deep pressure. I also suffer from anxiety and restless leg syndrome, which has devastatingly altered my ability to fall asleep at night (I was once a champion sleeper). Since I often wear compression socks to help with my restless legs (which honestly might be a placebo), a weighted blanket seemed like a great whole-body alternative, so I got on board with the trend just before the New Year. To understand what weighed blankets are—and why they’ve become so trendy recently—HelloGiggles spoke to the founder of SensaCalm, Donna Chambers. Chambers has been making weighted blankets since 2008 when her grandson was diagnosed with autism and she learned about therapy blankets, a tool long used in sensory integration therapy to support autism patients. Weighted blankets are simply blankets that have weight added to them for therapeutic purposes. While some companies, like Sheltered Co., use only natural fabrics to add weight, most weighted blankets are filled with other materials. Some companies, like SensaCalm, use polypropylene pellets and polyfill to add weight (though polyfill can be removed by request). Other companies, like Magic Weighted Blanket, use just poly pellets while others still, like Flat Hippo, prefer to use glass beads or stainless steel microbeads. Recommendations for the amount of weight to use are usually based on your total body weight. For instance, My Calm Blanket recommends the blanket be 7-12% of your weight, Gravity blankets recommends 10% of your weight, and SensaCalm recommends 10% of your weight plus one pound for a small blanket, two pounds for a medium blanket, and three pounds for a large blanket. While many companies go with the 10% number, researchers are still working to determine the ideal proportion. An occupational therapist wrote in a blog post for National Autism Resources that the appropriate weight could even be up to 20% of your body weight, depending on your situation, and Red Barn Blankets noted that the 10% weight measurement doesn’t take personal preference or size of the blanket into consideration. SensaCalm also says that the blanket should fit the size of your body—not the size of your bed. So if you share a queen-size or king-size bed with a partner, you don’t want the blanket to act as a comforter for the entire bed. However, the company Bearaby claims to make the only weighted blanket that can be shared with a partner and customized to on your individual needs. Chambers started SensaCalm to help provide products for people with sensory needs, but she has written about the many benefits of weighted blankets for others. Along with helping address symptoms of autism, Chambers says weighted blankets may help with insomnia, anxiety, stress, fibromyalgia pain, restless legs, post-traumatic stress disorder, attention-deficit hyperactivity disorder, and obsessive compulsive disorder. As for why more people who don’t have special needs are seeking out weighted blankets, Chambers noted the connection between health and stress. “These days people are so busy, overworked, tired, and stressed. Between the drain of living in a 24-hour news cycle on multiple electronic devices and just trying to stay above water with life’s daily struggles, stress is being recognized as a legit root of many illnesses,” Chambers told HelloGiggles. "A large segment of the public would rather seek natural ways to soothe their anxiety instead of simply medicating. This is why weighted blankets have grown in popularity as more people learn what the sensory-needs community has known for well over a decade. The deep pressure touch stimulation therapy of a weighted blanket (that firm, gentle, and consistent pressure on the body) can make you feel calmer, more relaxed, and less anxious." While many people have already benefitted from weighted blankets, the science to support them isn’t fully there yet. 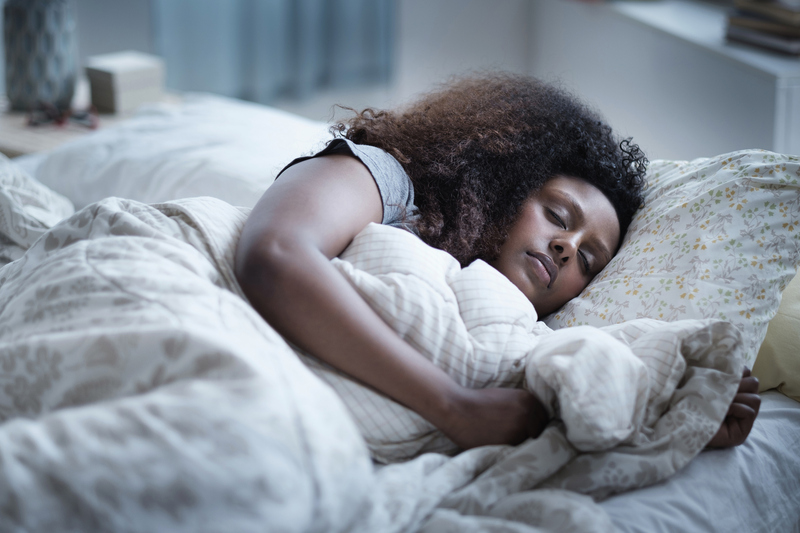 “Weighted blankets purportedly alleviate insomnia and anxiety, but so far, there are no large studies that support these claims,” family practitioner Dr. Honore Lansen of One Medical told HG. There has been research on the benefits of deep touch pressure for people with autism, like Temple Grandin’s “squeeze machine,” but there isn’t enough evidence to scientifically prove that weighted blankets provide all the benefits they claim to. Another study, published in the Journal of Sleep Medicine & Disorders in 2015, looked at how weighted blankets could help soothe insomnia. Again, the sample size was small with only 31 participants, but the researchers noted that the participants had a decrease in movement during sleep while using the blankets. And subjectively, the participants noted that they liked the blankets because they gave them a more secure-feeling sleep. There have also been studies around whether weighted blankets can help children ADHD, such as one in 2010 that looked at 21 children diagnosed ADHD and 21 children without and found that weighted blankets helped the children with ADHD fall asleep more quickly. However, not all weighted blanket studies come back with results that support their initial hypotheses. A 2014 study investigated whether weighted blankets could help in the treatment of children with autism who also have sleep problems. The conclusion was that the weighted blanket did not actually help the 67 children involved in the study have a higher quality of sleep. Yet, interestingly, 51% of the parents of the participants said that their child’s sleep had “very much improved/much improved” using the weighted blanket. And a majority of the children (who were between the ages of 5 and 16) preferred the weighted blanket over a regular blanket. Despite the lack of definitive results, you may still want to try a weighted blanket if you have trouble sleeping. “Some people may benefit. For people with insomnia or restless sleepers (or their partners), a weighted blanket may provide a calmer sleep,” Dr. Lansen said. But they are quite an investment, since a quick search shows that they can range from anywhere between $50 and $300 depending on the size and weight. (Although you can save some money by making your own or looking on alternative sites like Etsy.) And that doesn’t always include the duvet cover, which is often recommended so that you don’t have to wash your weighted blanket as frequently. Plus, some weighted blankets can’t be machine washed. “Since they can be pricey, it might help to try a night or two under a number of blankets to simulate a weighted blanket before investing in one,” Dr. Lansen said. She also added that while they are safe for adults and teenagers, they should not be used for infants or small children. So it’s best to speak with a health care professional, especially an occupational therapist, if you are looking for a weighted blanket for a child. As for my personal experience, I’ve only had my blanket for two weeks so I’m still testing it out. So far I’ve found that it can make me run a bit hotter during sleep, but it is comforting. While I haven’t found myself falling asleep much faster just yet and I still have restless legs, I didn’t expect that my nearly five years of sleep issues would be erased instantly by a single blanket. But as I try to fix my sleep habits (which include maintaining a more normal sleep schedule, not drinking caffeine or alcohol close to bedtime, and not playing games on my phone), I’m glad to have my weighted blanket along for the ride to snoozetown to provide natural, drug-free sleep support.